It happens in just about every MMO I play. Just when I’m feeling comfortable with a level capped character, suddenly another class pops up to steal my attention. This time it was the Stalker. I’m not really sure why I felt the need to start a new one. I guess it’s because I recently realized that I never gave my old one, my first character, a fair chance. This is just a rogue, a squishy stealth DPS, right? I haven’t been impressed with WildStar’s other two tanks, the Warrior and the Engineer. I feel like I should love the Engineer, but there’s something about the Volatility mechanic that I just can’t get into. The warrior did a little better, but it feels really slow overall and, ironically, I’ve died a lot more on this heavy armor character than any other. 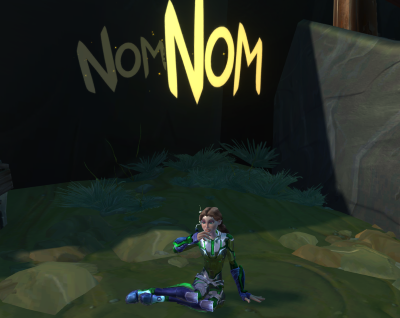 I was kind of resigned to the fact that I wouldn’t be playing a tank in WildStar, but then I did some dungeon runs with a stalker tank from my guild, and she did a really good job. Still, at that point I told myself that I didn’t need another character, I needed to stick with my Esper healer and get him geared. Besides, the 1-20ish zones are some of the worst in the game and I’m sick of them (that’s really unfortunate, by the way… they needed to revamp the early zones a lot more than the tutorial, which, by the way, is now just a commercial for the headstart pack I already own). But hey, when have I ever listened to my own advice when it comes to making new characters? So make a new character I did. First of all, the Stalker does ridiculous amounts of burst damage. My character is in her early 20s, and I’m still two-shotting normal enemies. Granted, I have no range whatsoever, but if you’re right in front of me, you’re dead before you can get a shot off. Sustained DPS is a little less impressive, but I also have some decent DoTs (nothing compared to the medic, but not bad). I’m also really happy to have some lifesteal; my biggest complaint with the Warrior was the fact that I had no survivability once my shield was down. The stalker is the most scrambling around mashing buttons I’ve done in any class so far, and I love it. All of that is pretty standard rogue stuff, but what really sets this class apart from those of other games is that I also have a lot of damage avoidance, so I can actually tank and do lots of burst damage as well. All in all, it’s a really fun experience that feels familiar and yet uniquely WildStar. How well will this translate into endgame? I don’t know; I’ve heard stalker tanking is hard because they have no range, and, in a game where you’re constantly scrambling to get out of telegraphs, range is a big deal, especially if you’re trying to hold agro. I’m not sure I really care, though. I’m more interested in healing at endgame anyway, so if this character is just fun for themepark leveling and never sees the inside of a dungeon, I won’t feel bad. If I get a new tank out of it, that’s great too. I definitely have more fun as a DPS-spec Warrior than I would have as a tank spec. I just enjoy the surge-loaded swipey smashy output, even if the hits of the sword don’t carry an impact heavier than tapping an empty soda can.